Can the Human Eye Detect Single Photons? The answer will shape the way sensors and similar technologies are developed. Physicists already know that the rods at the back of the human eye are sensitive enough to light that they can be stimulated by a single photon. However, whether or not this sensitivity carries through the visual and cognitive systems of the brain and triggers perception is a different question entirely. Testing this query has demanded technology that was unavailable until recently. Now, physicists can produce pairs of photons using photon guns that work reliably and on demand. The simple experiment to test the human ability to perceive a lone photon involves firing one into a human eye and determining if the subject observed it. 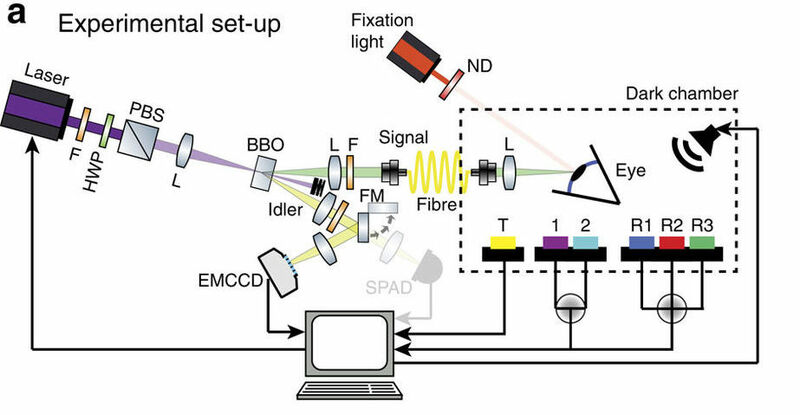 Pairs of photons are important to the setup of this experiment because they ensure that the researchers can monitor when the photon gun was actually triggered each time. However, it’s not easy to get good results despite this simple structure, because human observers are unreliable and a statistically significant result requires a high number of trials. However, researchers a the University of Illinois at Urbana-Champaign question have questioned that conclusion, saying that the data does not support it, and arguing that the experiment lacks sufficient statistical significance. The University of Illinois team has conducted its own research in human vision, so they have expertise in the field. So, why does this matter? To begin with, the ability to detect such a minuscule amount of energy would define the physical limits of biology expressed in the workings of the human brain — a “machine” functioning in a wet environment plagued by constant noise. If our eyes could pick up on single photons, measuring around 10 to 19 Joules each, it would paint a compelling picture of the power of human biological senses. Engineers and physicists aspire to achieve that kind of precision and sensitivity with their own machines in wet, warm environments, so modeling our machines after our own senses could allow us to reach higher goals. As we reveal our own sensory limits to ourselves, we can expect to see more impressive technological advances.